Hey guys recently updated to cura 4.0 and having a problem. i actually started having this problem on cura 3.6 but it is still persisting. Basically my main fan that is pointed at the nozzle is not being turned on during the print. I have all my settings within the program to have it on, yet while it is printing the fan is not being activated. If i send the gcode directly to the printer the fan turns on so the hardware is definetly working. I even tried adding some gcode to the "Start G-code" text box setting the fan to turn on in the beginning and it works but once it starts printing the fan turns back off. Any idea on how to fix this issue? I don't think it's the gcodes. I think it's a wire that opens up when the head moves to the middle of the print. I have same situation here, since i upgraded to cura 4, the fan won't start after the 1 layer. Yes same here. I can confirm that the issue is with cura 4.0.0 I think, going back to cura 3.4.1 no issues but with cura 4.0.0 I get no can as well. 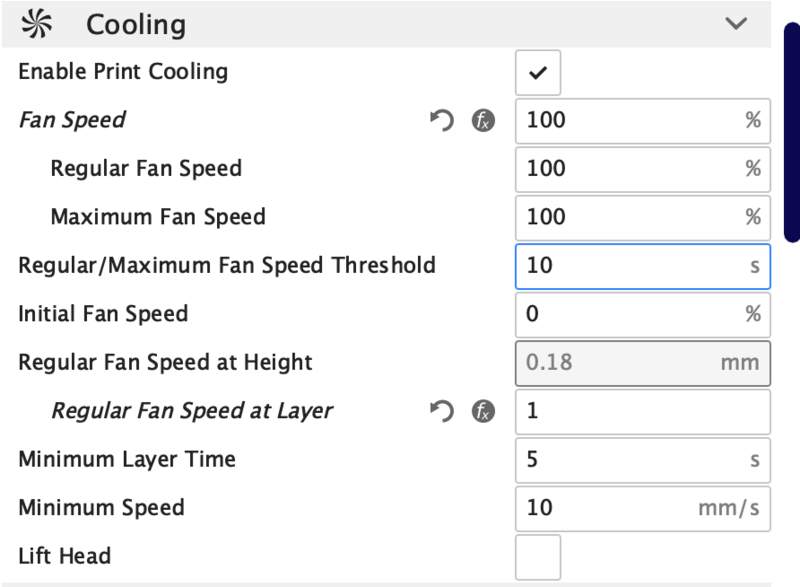 Cura 4.0.0 now has a new feature where you can select different number of cooling fans. I looked at the gcode exported from cura 3.4.1 and the gcode from cura 4.0.0. I noticed the M106 command was exported as M106 S255 P1. I compared this to the gcode exported from cura 3.4.1 which just had M106 S255. I first tried to modify the gcode to have M106 S255 P0, AND THAT WORKED Later in my investigation I noticed in the "Machine Settings" under "Extruder 1", there is a new setting called "Cooling Fan Number", by default it was set to 1, hence the "P1" reference in the gcode. Change the option under "Cooling Fan Number" from 1 to 0. After that I saw cura exported the gcode as before M106 S255. I popped in sd card and it seemed to solve my issue. I am sure maybe in the Marlin configuration you could change the fan number as well but this seemed to fix my issue.